Classic Bowling is an HTML5 bowling simulation game where the rule rules and mechanics of bowling applies. In this game, you must adjust your position, time your speed, and time your angle properly to hit all the pins and bring them down. Strikes gain bonus points so be sure to get as many strikes as you can. Just like in real bowling, If you manage to get a strike on the last round, you’ll have an additional round for a maximum of 2 additional rounds! Head to the your local bowling alley and polish your bowling skills in this awesome HTML5 game! Classic Bowling. Hit all the pins to score a strike! Try to score three strikes in the last round to maximize your score! 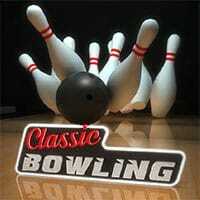 Enjoy and have fun in playing Classic Bowling Game. Good luck.